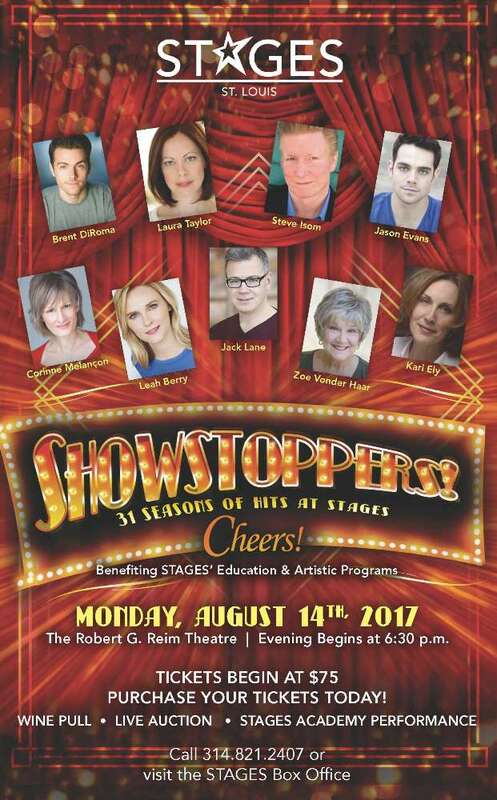 Stages St. Louis will be hosting their annual summer cabaret show “Cheers!” on August 14th. This year’s theme is “Showstoppers! : 31 Seasons of Hits at Stages.” The show also serves as a fundraiser for Stages’ educational and artistic programs. To learn more about the classes that Stages offers for up and coming stars, please visit: www.stagesstlouis.org/Performing-Arts-Academy. This year’s cavalcade of stars includes Brent DiRoma, Laura Taylor, Jason Evans, Leah Berry, and Corinne Melançon, as well as St. Louis theatricals legends Steve Isom, Kari Ely, and Zoe Vonder Haar. As an extra special treat, Stages’ own Executive Producer, Jack Lane, will come out of “retirement.” In addition to this impressive cast, the Stages Academy will showcase their talents in a spotlight performance. Throughout the evening, there will be a wine pull and a live auction. Last year’s live auction, hosted by the incomparable team of Isom and Ely, offered a bevy of impressive packages, including fabulous parties, trips to New York, tickets to Hamilton, and much more.